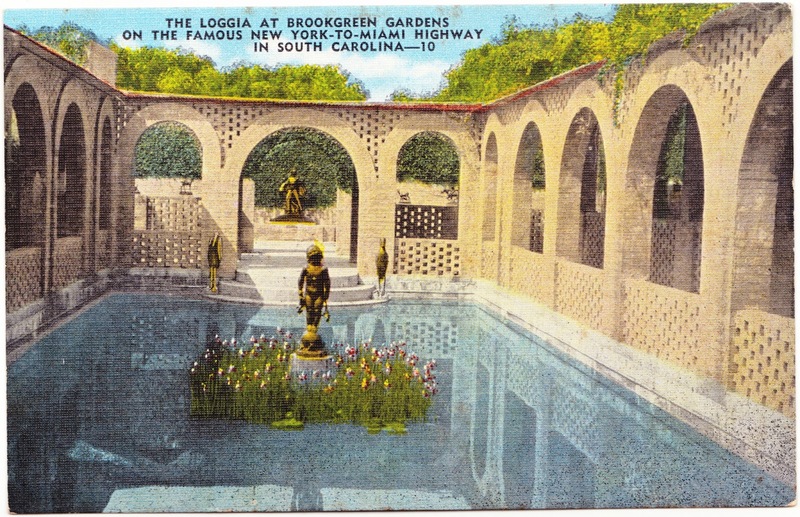 These two vibrant and undated linen postcards showcase Brookgreen Gardens nears Murrells Inlet, South Carolina (part of the Lowcountry). The sprawling park, which opened in 1932, was built atop several rice plantations, and covers more than 9,000 acres. It features gardens, trails, fountains, a wildlife preserve and more than 1,400 human sculptures.1 (Other accounts state there are more than 2,000 sculptures.) It is also home to a memorial for Theodosia Burr Alston, daughter of Vice President Burr. She was lost at sea, but her ghost is said to haunt the area. If you're planning a trip, service animals2 are welcome in Brookgreen, but pets are not. 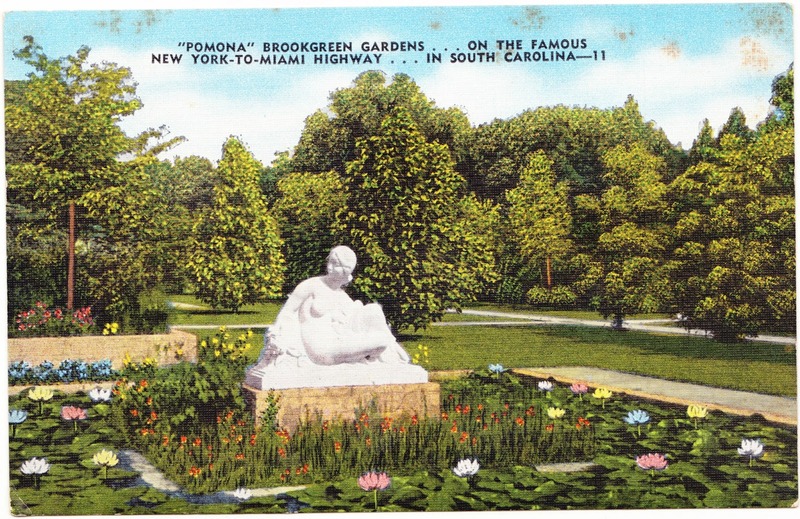 These two postcards feature "Pomona" and "Loggia" at Brookgreen Gardens. They tout that the attraction is located along "the famous New York-to-Miami Highway." I'm assuming that refers to U.S. Route 1, even though Route 1 doesn't come particularly close to Murrells Inlet or the Grand Strand as it passes through central South Carolina. It could also refer to I-95, although (1) that highway didn't open until 1957, which is almost certainly after this postcard's publication and (2) I-95 doesn't come much closer to the Grand Strand than Route 1. Any thoughts, highway-and-travel-history experts? These are "Natural Color Card" postcards that were produced by E.C. Kropp Company3 of Milwaukee, Wisconsin, and distributed by Florence News Company of Florence, South Carolina. 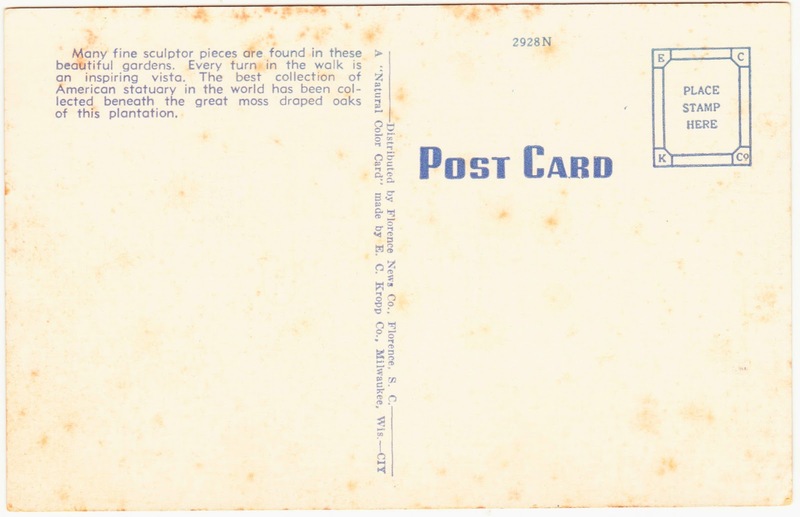 Neither postcard has been used, and the the backs have some significant foxing, as you can see here. 1. I hope that none of the sculptures are Weeping Angels. 2. I'm assuming that includes emotional support peacocks, but one can never be sure. Please call ahead. 3. E.C. Cropp was in business from 1907 to 1956, according to MetroPostcard.com.